The 2016 Indonesia Motorcycle Show (IMOS) is underway and the folks at PT Astra Honda Motor have showcased a number of motorcycles at the motoring event. One of the many products showcased at the event was the Monkey Concept which packed the classic style of the Z50 Monkey with the frame, engine, wheels, brakes and upside down front suspension from the MSX125. 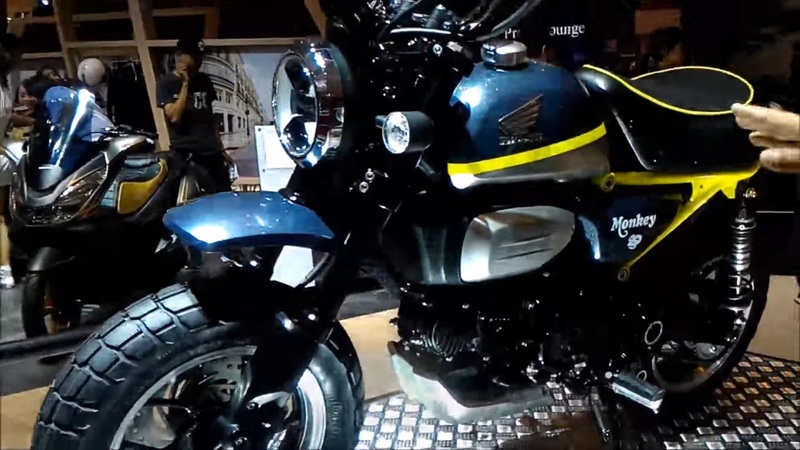 However, unlike the MSX125, the Monkey Concept dons a old-school style conventional, twin-sided rear suspension and a scrambler style tall set exhaust. The box-section swingarm of the MSX125 has also been replaced by a tube swingarm. Retro-styling of the Monkey Concept is further enhanced by round headlight, tail light and blinkers. The concept, as aforementioned, uses the engine from the MSX125. So propelling the Monkey Concept is powered by a horizontally placed 124.9cc air cooled 4-stroke engine with PGM-Fuel Injected. The engine is capable of producing 9.65 hp at 7,000rpm and a peak torque of 10.9 Nm at 5,500 rpm. The power is sent to the rear wheel by a 4-speed gearbox. The scooter rides on 12 inch wheels while the stopping power is provided by a single 220mm disc with hydraulic dual-piston caliper up front and a single 190mm disc with hydraulic single piston caliper at the rear.